In the First World War lots of soldiers, especially the German and French troops, used poison gas to weaken and kill their enemies. The most important poison gases were Chlorine gas, Phosgene and Mustard gas. Chlorine and Phosgene belong to the group of warfare agents, which attack the lungs. A NBC-mask can protect against those warfare agents. Therefore, the soldiers began to use certain mask breakers, which forced their enemies to put down their protective masks. After that, they shot with chlorine or phosgene to kill the enemy soldiers. Chemical weapons have been mentioned since about 424 BC. For example, sulfur is burned and reached the enemy with the sulfur dioxide. Consequences were an acrid smell which should bring the enemy to unconditional surrender. During World War I, in the year 1914 the French started using tear gas as a weapon. The first attempt failed because of decomposition of the ingredients due to high temperatures. The reason why Germany had to make use of chemical weapons is due to the special situation of the Central Powers. Germany was cut off from supplies of raw materials, especially those needed to make explosives and gunpowder. Without a solution to this problem, in 1915 Germany would already have been forced to ask for peace. However, since Germany had the best chemical industry, it was possible to chemically balance the deficiency. However, from November 1914 on in an impasse trench warfare, there was a demand for gunpowder, that could barely be covered. Chlorine and Bromine being the basis of poison gas weapons were waste products in the production process of gunpowder. 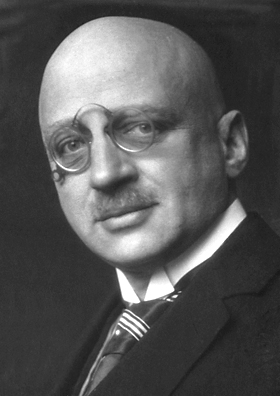 One of the leading heads behind it was Fritz Haber (Foto left). On April 22nd 1915 chlorine gas was used for the first time at Ypres (Belgium). German troops set it free by using the so called „blow process“. They set free a 6km wide and 900m deep cloud of this gas. They had to wait for good weather. 150 tons of chlorine was applied from 40000 cylinders within 5 minutes of this attack and the wind should blow it over the enemies’ trenches. Although, the wind posed a significant drawback for the Germans, mostly because there was a predominant westerly wind on the Western Front. Since chlorine is heavier than air, because of its density, it fell down in the trenches and caused 5000 dead and 10,000 wounded. The German troops were moving with breathing masks behind the gas cloud. However, the necessary resources to properly utilize this advantage were missing within the German troops. To ward off gas, the enemy was dependent on towels moistened with urine. From September 1915 they had hoods which neutralized the chlorine gas. At the same time, the investigation of phosgene began. Phosgene was first used by German troops on May, 31th 1915, again in Ypres. From September 25th 1915 on, the British troops also attacked with chlorine. Now the gas war was no longer a secret weapon. For further developments, there was always a consistent pattern in this war. The Germans set forth a gas, which then was analyzed by their opponents and copied. Constantly the gas masks were perfected. Therefore, the troops combined mask breaker with deadly chlorine gas to bypass the gas masks. The irritating chemicals (often in liquid form), could often penetrate the filter of the masks and thus, were inhaled by soldiers and irritated mucous membranes. The soldiers were forced to take off the masks. The chlorine gas killed them. In June 1916, the first use of phosgene by British troops took place. The filling into shells facilitated the attack. It was no longer necessary to pay attention to wind direction and the spread could be better controlled. The gas attacks and gas volumes increased dramatically. The grenades were marked with crosses of different colors that showed the kind of fight substance. So cauterizating agents as mustard gas or suffocating ones were marked with a green cross (Green Cross), nose and throat irritants were referred to as Blue Cross and eye irritants as White Cross. The first use of mustard gas was again in Ypres on July, 12th 1917 by German troops. This is the final dramatic increase in the gas war. Overall, the gas war claimed 100,000 dead and 1.2 million wounded. Although using of poison gas was officially forbidden, it was used in the First World War until the Geneva Convention forbade using chemical weapons again. In the Second World War nobody used poison gas (officially), because it was and still is internationally banned. 3. What do the terms "chemical warfare agents" or "chemical weapon" mean? Chemical warfare agents are a group of highly toxic chemicals. Even the contact with very small amounts of these substances can kill humans (and other animals) or seriously injure them. They belong to the ABC weapons. (Nuclear weapons, biological weapons, chemical weapons). They were intended as an advantage. This can be done by killing, as well as by physical or mental irritation. Chemical weapons are technical devices / systems that carry a chemical warfare agent to a destination and there distribute or release it with high efficacy. Chemical warfare agents are divided into five categories. Irritants that impair the eye and the respiratory tract. An example is tear gas. Incendiaries. These are highly flammable substances to cause fire, an example is napalm during the Vietnam War or white phosphorous. Fog substances are substances intended to reduce visibility and make it difficult for the enemy to attack, for example, Smoke bombs. Plant-damaging chemicals are affecting the vegetation and thus facilitate the attack of the enemy. As Agent Orange was used for defoliation of trees in the Vietnam War. Chemical agents can be absorbed by inhalation, through the skin, through wounds, through food and beverages. Although chemical weapons almost always affect several parts of the body, they are divided according to their strongest effect. Since this is generally similar to the chemical structure it became useful for a subdivision of the agents. Chlorine gas is yellow-green, suffocating and smelly gas and is very poisonous. It is considered as respiratory poison. Clark is an irritant, which was used to “unmask“ the enemy soldiers. The Clarksalt was filled into bottles together with explosives. When they explode the Clarksalt streams out in form of aerosols. These tiny particles could go through the masks and irritate the mucous membrane. The effect was a strong coughing fit, nausea, shortness of breath and sometimes vomiting. The name is derived from the German word chlor arsen kampfstoff. Another name is Diphenylarsinchlorid. It was discovered 1878 by Michaelis and La Coste. There are three types of clarks the first, second and third. They are different in their structure but in their effect they are the same. Phosgene also acts as a respiratory poison. It was often used in combination with chlorine gas as at a much lower concentration phosgene is toxic and deadly. Mustard gas (Lost) is a highly toxic substance and has a garlic-like or mustard-like odor. It was first produced by the Belgian chemist César Mansuète-Despretz. In 1854 The Frenchman Alfred Richter produced Mustard gas from Chlorid and Diethylsulfid. The idea to use it as toxic gas came from the German chemists Wilhelm Lommel and Wilhelm Steinkopf. The name Lost came from the 2 first letters of their last name. Mustard gas is the product of an electrophilic addition of sulfur dichloride to ethene. Electrophilic addition is called the response when unsaturated hydrocarbons react with other substances groups. Unsaturated hydrocarbons are carbon-hydrogen compounds having multiple bonds. As Lost unfolds its effect on the respiratory tract via the skin, you could deal with the gas without having to put on gas masks. Mustard gas inhibits some enzymes and damages DNA. This reaction shows how Mustard gas makes the cell killing itself trough causing necrosis. Short descripiton: colorless and odourless liquid (pure). Normally pale yellow up to brown. Slight garlic or horseradish type odour. Choking agents (e.g. chlorine gas) are highly irritating to the lungs, especially in the alveoli. The fight substance is mainly released as a gas. After the inhalation the substance interferes with cell metabolism in the lungs damaging the walls of the air sacs (alveoli) and the blood flow in these capillaries. This has the consequence that the alveoli are filled with body fluids (pulmonary edema) and thus prevent the exchange of gases (diffusion) between the blood and the inhaled air. The O2 and CO2 molecules have to overcome a greater distance. As a result of this accumulation of fluid in the alveoli up to 30% of the circulating blood is withdrawn. The poisoning with lung-damaging warfare agents leads to four different stages. The first stage occurs directly at and after inhalation. It comes to sneezing and coughing stimuli, such as a burning nose and throat irritation, feelings of anxiety, and headaches. This stage disappears after 30 to 60 minutes completely. It is important to note that some agents can cause no or only a very small first stage. The subsequent stage can persist from 4 up to 12 hours, during which absolute freedom from symptoms is typical. The only observing feature is a respiratory acceleration often in combination with a deceleration of the heartbeat. The transition to the stage of the toxic pulmonary edema begins with a worsening of the general condition, cough, dizziness, and a bad taste in the mouth. In addition, an increased heart rate can be observed. As a consequence of the emergence of pulmonary edema an increasing oxygen depletion occurs, which can damage the heart, the brain or even the kidneys. On the second day after the intake of the chemical warfare agent, the stage of toxic pulmonary edema reached its peak. It now comes to fever, severe mental restlessness, severe respiratory distress during inhalation, tormenting cough with abundant brownish mucous expectoration, severe pain behind the breastbone, rattling breathing in all areas of the lung as well as bluish later grayish coloration of the skin, resulting from the anemia. At least at this stage a cortisone treatment must be done. This stage may last for 24 to 36 hours. It is the state with the highest death rate. If one survives this stage the general condition improves. The decrease of the body temperature to normal standard and a decrease in breathlessness can be observed. The inorganic chlorine gas (Cl2) was the first poison gas, which was used as a deadly weapon and thus as a weapon of mass destruction in World War I. Elemental chlorine is a green to yellow and highly toxic gas, which can bring about severe damage to the lungs and airways even in small quantities. It is equipped with an atomic weight of 35.5 heavier than air and sinks into the trenches during the gas war turning them into mass graves. Along with fluorine, bromine, chlorine, iodine and astatine it forms the group of the halogens and is therefore to be found in the seventh main group of the Periodic Table. After the chlorine fluorine it is the most reactive element of non-metals, and particularly for this reason, elemental chlorine is toxic. If it reaches the respiratory tract in a high concentration of about 0.5-1% very damaging to these tissues, therefore death occurs very quickly. Together with water (H2O) chlorine forms the hydrochloric acid (HCl), and hypochlorous acid, latter decomposes rapidly. Acid is corrosive to the lungs and it can develop fatal pulmonary edema. In addition, the gas exchange cannot work properly, because the mucous membranes of the alveoli swell and the O2 and CO2 molecules can no longer easily diffuse through this membrane and balance the concentration gradient. You suffocate. However, even with only 0.01% of chlorine in the air and lasting inhalation lethal burns are caused. At a chlorine concentration of 0.001%, the lung is also attacked, but no permanent damage will be suffered only at 0.0001% or below. The formation of hydrochloric acid thus lowers also the pH value, this leads to the denaturation of some proteins in human body. Not only pure elemental chlorine was used as a weapon, but also as Cyanogen chloride and hydrogen cyanide, which also contain chlorine. They belong to the group of blood agents. Negatively charged chlorine ions are not only destructive to the human body, they may also be vital for humans, because they support the acid-base balance, the water balance, the formation of the gastric juice and much more. These are absorbed through the normal saline and then re-used. Blood agents can be absorbed through the respiratory tract, the digestive tract, and on the skin. The absorption mainly happens through inhalation. Due to the ability to be absorbed through the skin, gas masks do not provide adequate protection. Blood agents affect cellular respiration and cell metabolism. They contain cyanide, which deposits on the iron ion of the cofactors. This complex is extremely stable. It prevents the binding of oxygen to the enzyme during cellular respiration in the mitochondria, so it comes to the so-called internal suffocation. With a large excess of oxygen, however this can be resolved again. Blood poisoning by warfare agents usually show four different stages in sequence: The initial stage, the "asthmatic" stage, the convulsive stageand the asphyctic stage. In the initial stage, a typical odor is perceptible, depending on the chemical agent used. Some of them are odorless gases. They cause a increased tear and saliva flow, accompanied by temporary headaches, nausea and vomiting. In asthmatic stage, there is difficulty in breathing, pupil dilation, chest pain, and eye muscle paralysis. The damaged person is strikingly disoriented. There may be language disorders. The subsequent convulsive stage leads to an increase of breathlessness. In addition there are cramps and unconsciousness. In asphyxial stage there is a paralysis of the muscles, especially of the respiratory muscles. A repiratory arrest occurs followed by a few snap breaths. For several minutes after complete respiratory arrest there still can a heart activity. Blister agents are highly reactive compounds. The agents act through the skin and conjunctiva, but can also be absorbed through inhalation or by mouth. The inclusion of the chemical warfare agent through the skin is usually not life-threatening, as long as not too much skin surface is affected. However, if large quantities of the chemical warfare agent are inhaled, the lung damage can be fatal. They interfere with the metabolic processes of the cell, such as cell division and cell growth. The erythematous form lasts approximately 12 hours while the person concerned notices a slight burning or itching, increasing tenderness, redness and swelling of the skin in the affected section. This will be healed within 5-10 days without scarring, but it leaves a pigmentation. The bullous surface form has a reaction time of 6-12 hours. The beginning is like the erythematous form. Out of the erythema a bulging bubble is formed in the shape of former edema. After 10 to 12 hours there is a pale restrained herd in the infiltrate. Afterwards there occurs a development of small blisters (amber-yellow content) in this area. It heals within 3-4 weeks without scarring but leaving behind a pigmentation. The deep bullous form has a reaction time of 2-6 hours. The beginning is like the erythematous form. In the center of the injury there is a swelling and increased infiltration, which subsequently turns gray-yellowish and is surrounded by bubbles in the shape of a string of pearls. An ulcerous-necrotic process follows. It heals within 2 to 3 months and develops a de-and hyperpigmented scar. Infections are typical. In the blow molding process, the gas is released using hoses off of their own position. The advantage is that a large surface area can be covered. The disadvantage, however, is that when the wind changes direction, the gas can be returned to the bearing. Furthermore, it requires a large amount to cover a large surface area. Because of the disadvantages of the blowing gas grenades were used. Colored crosses indicated the contents. Blue crosses stood for chlorine and arsenic mustard gas called sulfur mustard (Lost) and Green Cross consisted of phosgene and Diphosgene. Colorful shooting is referred to as the use of multiple substances. For example, Blue Cross was used to penetrate the gas masks and caused strong cough, which forced the enemy to remove the mask. At the same time Green Cross was shot, which attacked the lungs and lead to suffocation. 5. The gas war-a war crime? The Hague Convention of 1899 banned the use of arms causing suffocation. The Germans claimed that the release of toxic gas clouds is not a violation of international law. This assertion is incorrect because the Hague Convention of 1907 forbade "the use of poison or poisoned weapons." Thus, the use of poison gas in any form can be regarded as war crimes. The German and Allied Forces reproached each other of having started to use gas. Its use could not be restricted to combatants. In the Geneva Protocol (of June 17th 1925) poison gas and bacteriological methods were banned as a response to the experience of WWI. During World War II this obligation was respected, although not all countries had accepted the Protocol. Since 1997, chemical weapons are internationally banned by the Chemical Weapons Convention (CWC). The development, production and stockpiling are prohibited.